This hand-crafted Nativity set is made by a women's group in Kathmandu that seeks to help poor rural women in Nepal. The body of these dolls is made of recycled wooden products mixed with wax and dressed with corn husks. The face, hands, and feet are hand-painted. 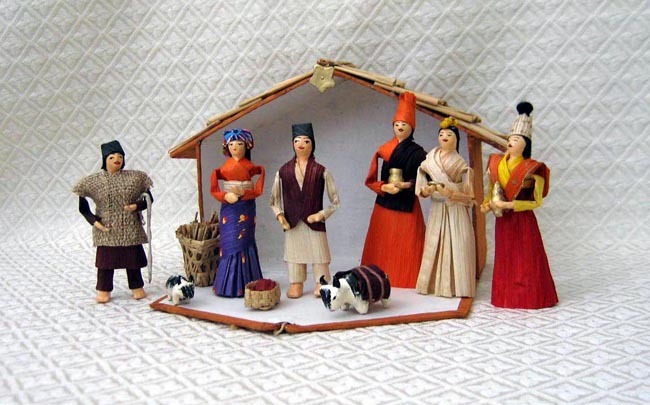 The figures dwell in a stable of recycled paper with a roof made of straw. The stable is cleverly designed for both displaying and storing the figures. The figures stand approximately 4 inches tall. The stable measures 7.5 inches wide by 6 inches tall by 2.5 inches deep. Mother Mary, dressed in a traditional Nepali costume and earrings, stands proud with her son sleeping in a woven bamboo kokro, a basket widely used as a cradle in Nepal. Joseph stands at Mary’s side. The three wise men represent different Nepali ethnic groups: one is a Buddhist monk, one is a Hindu priest, and the third is a Sherpa priest (from R to L). How often do you see Buddhists and Hindus in a Christian Nativity scene??? The shepherd boy, dressed in a jacket woven from nettle fibre, has driven the two yaks from the high Himalayas. A large ornamental basket of reeds completes the set.